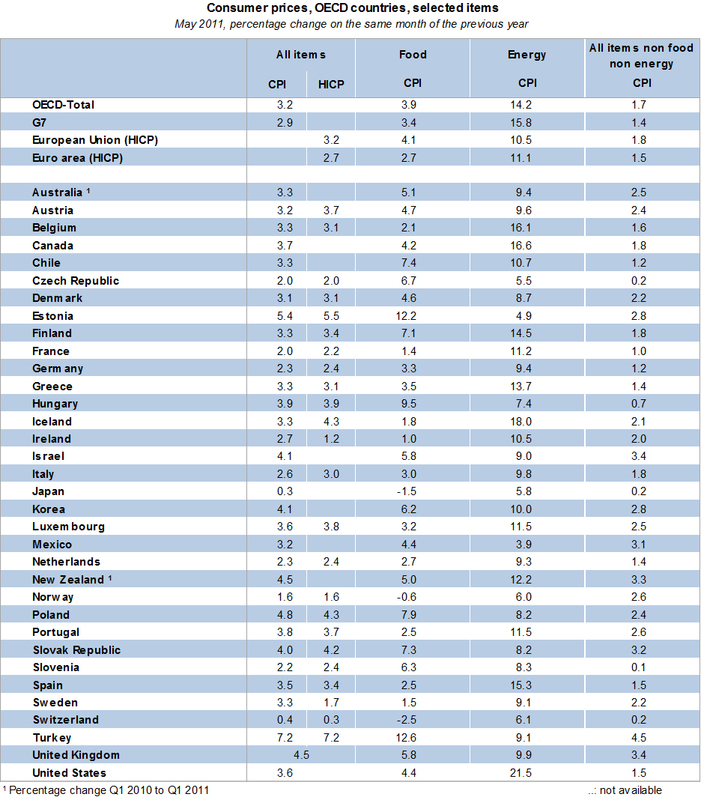 The Organization for Economic Co-operation and Development (OECD) has finished aggregating the May inflation data provided by its member countries and has released the results. Energy prices were up a whopping 14.2% for the 12 months ending in May while food prices were up by 3.9%. The overall average for all products in all the OECD countries was 3.2% in May. This was up from the 2.9% reported in April. The major components of this increase were mainly a sharp acceleration of inflation in Canada (to 3.7% in May, up from 3.3% in April) and the United States (to 3.6%, up from 3.2%) with high food and energy prices being the main drivers. The following chart breaks the components down by color so we can see how the food and energy components affect the total. In other major OECD economies inflation remained either stable (United Kingdom, 4.5%, Italy, 2.6% Japan, 0.3%) or slowed (2.3% in Germany down from 2.4% and 2.0% in France down from 2.1%). Euro area annual inflation (HICP) also slowed to 2.7% in May, down from 2.8%. The picture was mixed in other major non-OECD economies. While inflation accelerated in South Africa (to 4.6%, up from 4.2%), China (to 5.5%, up from 5.3%), and Brazil (to 6.6%, up from 6.5%), it was stable at 9.6% in the Russian Federation and slowed to 8.7% in India (down from 9.4%) and 6.0% in Indonesia (down from 6.2%). Compared to the previous month, consumer prices in the OECD area rose by 0.3% in May 2011. They rose by 0.7% in Canada, 0.5% in the United States, 0.2% in the United Kingdom, 0.1% in France, Italy, and Japan and, remained stable in Germany. In the following table we can see the inflation rates of the various member countries as well as the European Union. Including both the CPI and HICP broken down into all items, food only, energy only and all items excluding food and energy.